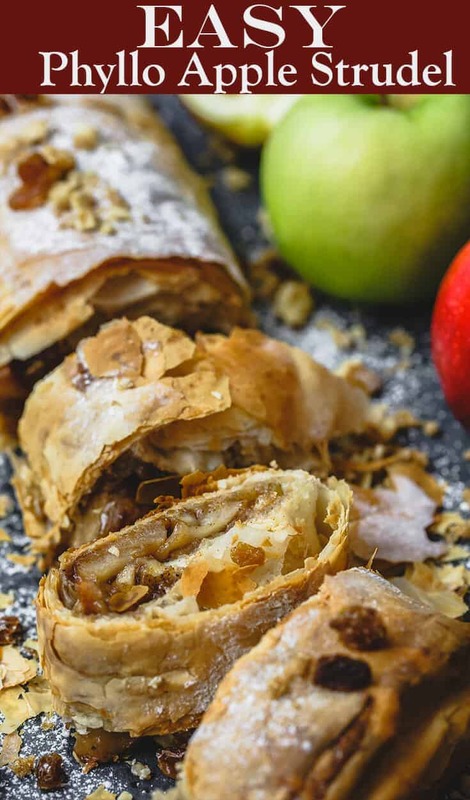 Homemade apple filling rolled in layers of paper-thin phyllo makes a light, flaky, and extra crispy apple strudel. 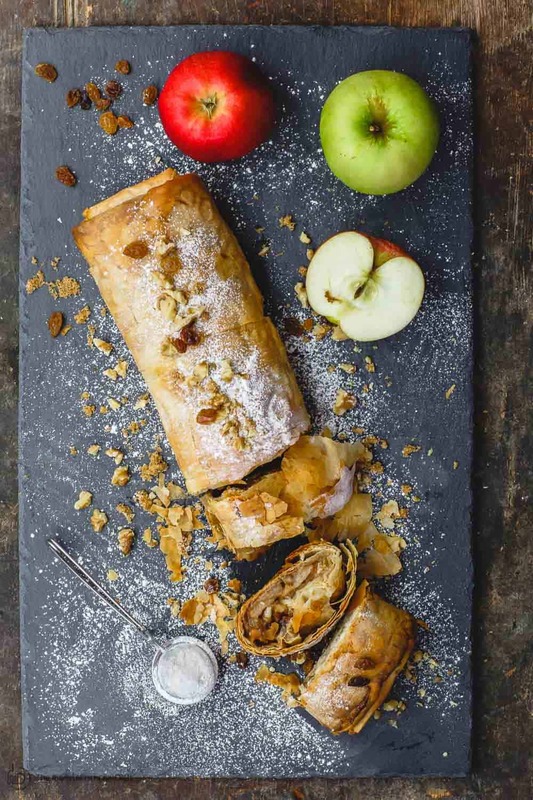 This easy apple strudel with phyllo dough is the perfect dessert for a small crowd. Trust me, you’ll be the hero of the party! If you’ve been following for a while, you probably already saw one of my favorite desserts this Italian Apple Olive Oil Cake. I was about to bake it again last week as a little fall treat (although it is still quite hot in Atlanta), but I decided to try my hand at this apple strudel instead. We all know we have Europe, and in particular, Austria, to thank for the delightful idea of apple strudel. Such a tasty pastry, no wonder it’s been adapted throughout the world. And mine is a fun spin on the loved classic. These days, busy bakers often replace homemade dough with store-bought puff pastry when making apple strudel. But for this apple strudel, I’ve decided to use phyllo dough. 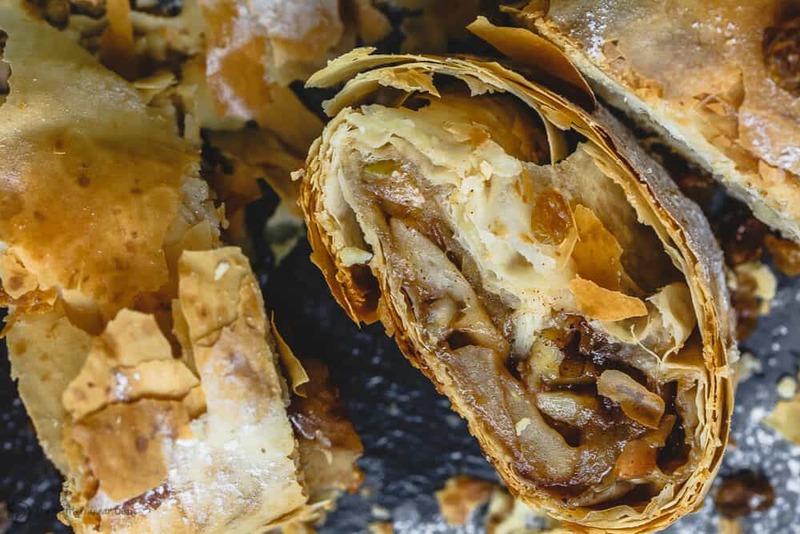 Layers of fat-free, paper-thin phyllo sheets–lightly brushed with a mixture of extra virgin olive oil and juice from the apple filling–made a light, flaky, and extra crispy apple strudel. For the filling, I used a combination of Granny Smith and Gala apples; I like the balance between tart and sweet. Traditionally apple strudel filling is not cooked before the strudel is baked. But I’ve found, a super quick sear helps the apples release a little juice while taking in all the flavor goodness from a little brown sugar, cinnamon, nutmeg and cardamom (yup, I played with spices a little!) Raisins and walnuts complete the filling. 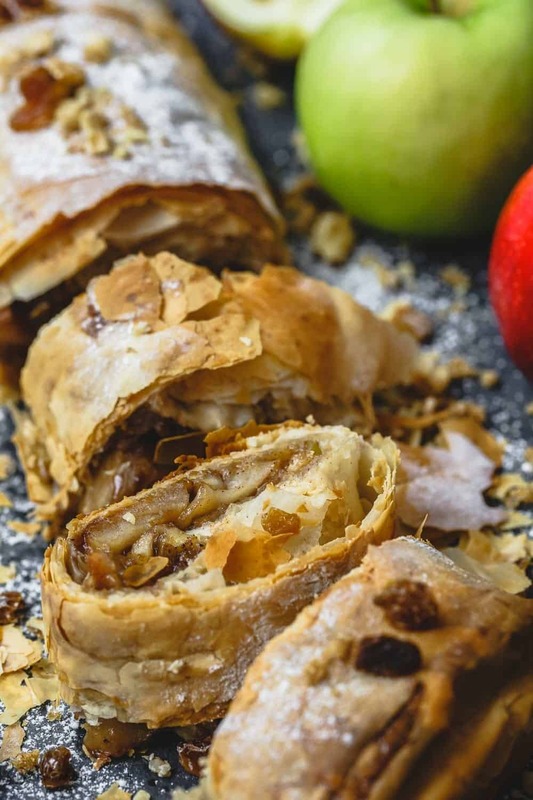 To assemble our apple strudel, once the phyllo sheets are layered, and lovingly brushed with our EVOO mixture, you simply pile the filling on top and fold in the edges then roll to the other side (jellyroll style). Work fast so that the phyllo does not dry out and begin to break. You will work with one phyllo sheet at a time, if you need to, cover the rest of the sheets a kitchen towel as you work, this will help. When you roll the dough to enclose the apple filling, too tightly so it doesn’t crack and burst open in the oven. And be sure the seam is down as indicated in the recipe. Can this apple strudel be prepared ahead? You can prepare the filling the night before; cover and refrigerate until ready to use. For best results, and so that the phyllo dough does not get soggy, it’s best to bake this apple strudel on the day you plan to serve it. If you really need to, you may bake the strudel the night before, but only part-way (about 70% or so), then finish baking the next day before serving. 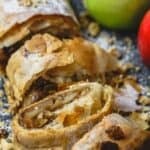 Homemade apple filling rolled into phyllo dough makes a tasty, light, and extra crispy apple strudel. Make the filling. In a large skillet heat ghee and extra virgin olive oil. Add the sliced apples, brown sugar, cinnamon, nutmeg, cardamom and orange juice. Cook over medium heat, stirring as needed, for about 2 minutes or so (you are not looking to cook the apples all the way, just a little bit to allow some juice to release.) Stir in walnuts and raisins. Remove from heat and set aside briefly. Prepare a large baking sheet lined with parchment paper. Pour the juices from the apple filling in a small bowl and mix with a little more extra virgin olive oil (you’ll use this mixture to brush the phyllo sheets). Take 1 phyllo sheet and lay it in the prepared baking sheet. Brush with the mixture you prepared (apple filling juice and olive oil). Sprinkle a little brown sugar on top. Repeat the process with the remaining phyllo sheets. Now, with the baking sheet placed horizontally (one long edge of phyllo facing you), spoon apple filling somewhat towards the middle leaving about a 2-inch boarder of phyllo all around. Fold short edges of phyllo to cover 2 -inches of apple mixture on each end. Brush ends with extra virgin olive oil. Starting at long edge closest to you, fold phyllo over apple filling and roll towards the other end (jellyroll fashion, but do not roll phyllo too tightly). Keep the seam on the bottom. Brush strudel with extra virgin olive oil. Bake in 375 degrees F for 35 minutes or until phyllo turns a nice golden brown. Remove from oven and let cool in sheet pan. 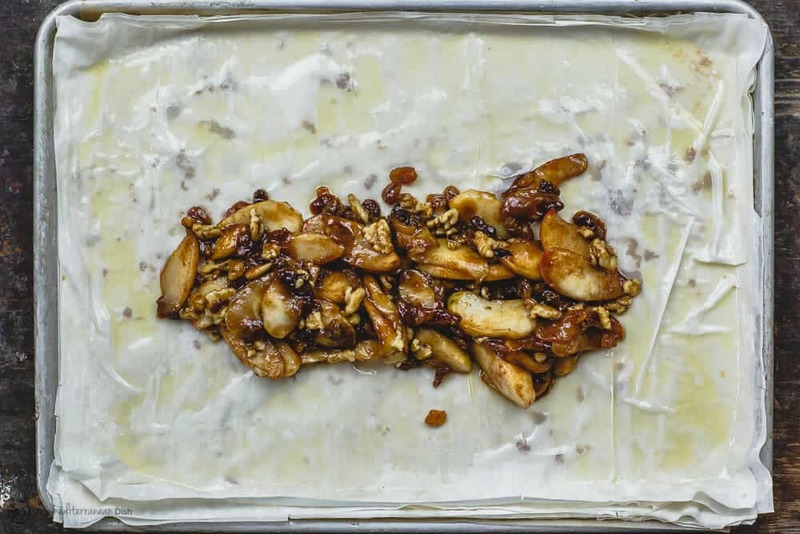 To garnish, sprinkle apple strudel with confectioner’s sugar, add any walnuts or raisins remaining. Slice and serve. Where to find phyllo? Phyllo dough is available in most grocery stores in the freezer section next to pie crust and puff pastry. Pro Tips for Phyllo. 1. Thaw phyllo overnight in the fridge. Take out of fridge about 30 minutes before using. 2. This recipe only uses 10 sheets, once you set those out for use, go ahead and roll the rest in plastic wrap and put back in the box and return to freezer for later use. 3. To assemble the phyllo dough, work right in your sheet pan that you will use to bake the strudel, that way you don’t have to risk breaking the strudel when transferring. 4. If you don’t have enough juice from your apple filling to brush the phyllo sheets, simply use extra virgin olive oil. You only need to brush the sheets very lightly with the EVOO and sprinkle a little bit of brown sugar and cinnamon on top for flavor. 5. Finally, when you roll the dough to enclose the apple filling, too tightly so it doesn’t crack and burst open in the oven. And be sure the seam is down as indicated in the recipe. Pro Tip to Prepare Ahead. For best results, bake the phyllo apple strudel on the day you plan to serve it so that the dough does not turn soggy on you. Now, you can prepare the filling the night before, cover and refrigerate until ready. If you need to bake the strudel the night before, you can go ahead and bake but only part-way through (about 70% or so), then finish baking the next day before serving. Oh I love apple strudel. This looks PERFECT!! Oh my goodness!! What a fall recipe.. perfect use of apple ?? This is something new I have learnt today.. can’t wait to try it! I can’t wait for you to try it, Sonia! Enjoy! What a great idea! It takes the typica apple strudel and elevates the texture. I love it! This wouldn’t stand a chance around my husband! That flaky dough and the spiced apples are just to die for! Oh that looks SO good. I want to eat it with lots of custard. If you give it a try soon, I wanna know! I love all things apple during this time! Can’t wait to try this! Wow! Your photos are making me drool! Gorgeous clicks and what a stunning recipe! Awww thanks so much, Shashi! 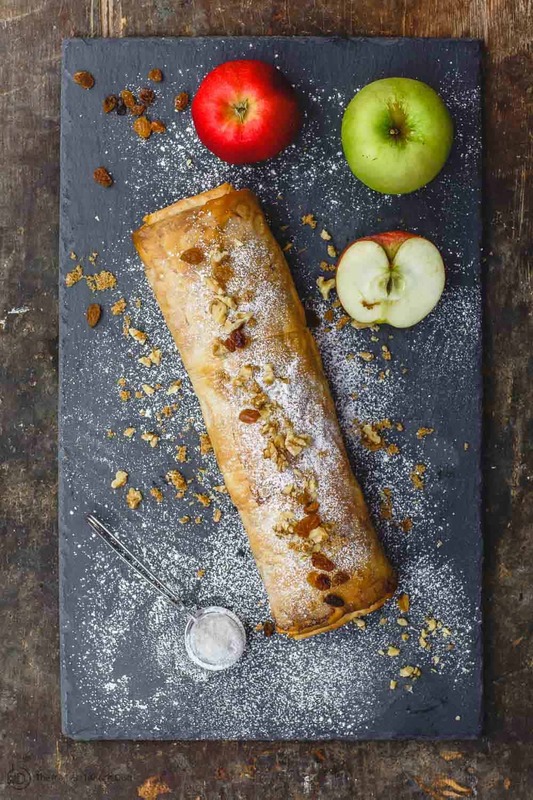 Your photos truly highlight this delicious apple strudel. What a great way to celebrate the fall season. Thanks so much, Kelly! Enjoy!